Darwin’s Fox the finishing touches! 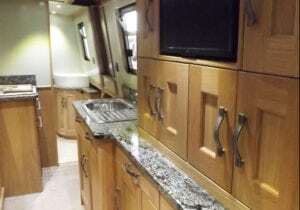 We are currently selecting the finishing interior touches to narrowboat Darwin’s Fox the newest member of our canal holiday hire fleet. We’re feeling very excited about the launch of our first ‘Platinum Fox Class’ boat, she is guaranteed to be a sensational boating experience! With our extensive narrowboat building expertise, this 65½ foot boat has been designed and built, by us with your holiday in mind. This exceptional craft blends traditional narrowboat features, with a light, bright and contemporary interior, incorporating a luxurious and innovative design. In addition to the excellent facilities on our 4* fleet, she boasts a King-sized wide double bed, granite surfaces in the galley and bathroom, underfloor heating in both bathrooms and even a hydraulic bow-thruster that allows you to steer her with ultimate precision. Darwin’s Fox also has a comprehensive AC electrical system which allows for homely comforts that had previously been compromised on narrowboats such as, a Nespresso coffee machine, a separate drinks fridge, USB charge points and 3 televisions including a 22″ TV in the saloon which has Bluetooth connectivity for your portable streaming devices. Guests on board Darwin’s Fox can count on receiving our same excellent level of customer care that we at Foxhangers have always prided ourselves on, and our many returning customers have come to expect. We are now taking bookings for Darwin’s Fox for weekly breaks in 2018.